What if you could carry the wisdom and inspiration of 20 strong and insightful women with you each and every day? You’d never have to face your struggles alone! Women on Fire: 20 Inspiring Women Share Their Life Secrets (and Save You Years of Struggle!) 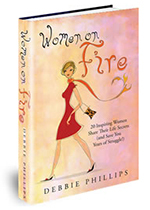 is a heart-stirring and heartwarming anthology of stories written by 20 courageous and powerful women who faced real-life challenges and successfully moved through them to become authentic Women on Fire. Each woman shares the details of a seemingly insurmountable obstacle and describes how she summoned the strength to overcome it and emerge stronger, healthier, happier, and more deeply fulfilled. The most important part of their message is that you can do the same!